Welcome to week 6. Our post is a little shorter this week, but we’ve been busy prepping for DCMPs and other events ourselves. We’re starting it off with PNW, since I guess PNW loves this account the most. edit: we forgot 2930 – sorry guys! You’re in the top 8 somewhere (oops). 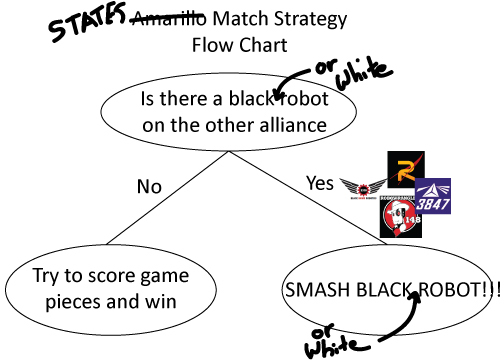 While they have not had the chance to play together this season, it’s time for PNW to Bear the Jack in the Metal Bot. 2046 is the best robot in the district because it can do everything and do it exceptionally, and 2910 is quite complementary since they are the best low only robot in the district (but lower on our list, since it has a lower ceiling). These are the two teams that have shown consistency is key and with a 90% win rate each they look to keep that up. However, they’ll still have to perform to fend off some of the other top teams. 1983 is fresh off of a stellar performance at Idaho, where they fell just short of the win in Finals 3. They’ll come back with a vengeance and look to take home a winner’s blue banner which has eluded them all season. 2990 did well all last season and struggled at DCMP but will do everything in their power to remedy that this year. 5803 had a rough last event, but showed serious skill and reliability at Mount Vernon and SunDome. 2471 will use their level 3 climber to seed high, and their arm to score them some victories and put them right in the thick of the competition. 3674, their partner at Lake Oswego, is also one to luck out for since they haven’t needed many lucky clovers to succeed this year. Finally, 1540 is ready to turn up the heat and bring it. We predict that it will be 2046 and 2910 taking home the win, beating 1983 and 2990 in a close 2-1 series of matches. Ah, North Carolina, home of foam tiles and… Sloppy driving? 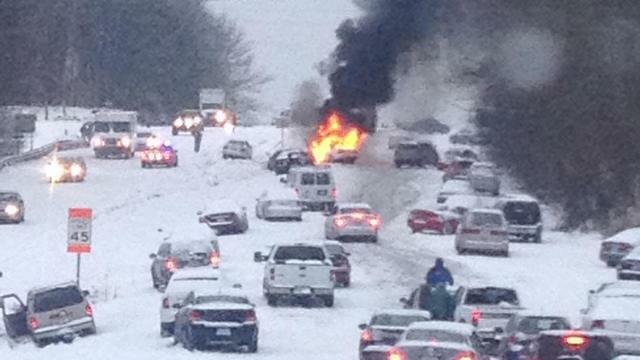 This image seems to sum up NC driving, both when it snows and when defense starts getting played. However, 2655 seems to be a cut above the rest, and we expect them to be the first overall pick at the event. We don’t expect anyone here to coast to a 6-0 run in elims at this event, given that every team here has dropped at least one elims match this season. 5190-2655 are the favorites, but 5511 has seeded first at both of their events and could split the winning Asheville alliance up. 7671 comes in as a bucket on wheels (and a hatch mechanism, but that’s not as funny as a bucket) and has managed to take some games off some of the top teams listed here. If anyone is going to pull off a Cinderella story from a low seed, it will probably include Fire Hazard (or as that one guy said, the best rookie since 2056 ). Now that 2056 has made their debut, it is yet again completely certain they are one of the best robots in the world. So who will they choose? 5406 took down the Ryerson event in dominant fashion, 1325 showed rapid improvement at Georgian to narrowly lose in finals, and 1241 didn’t take 2056’s challenge at Waterloo lying down. With that in mind is most likely they pick 5406 since they have the teleop skills and an impressive level 3 climb; the others are only level 2. Don’t forget about 2200 who will also be thrown into the mix, as their Week 1 performance showed a reliable climber and they will have been focusing on improving their weakness (cycling) to become a serious contender and likely seed above 1325 and 1241. Our prediction is that finals will see 2056 and 5406 take down 2200 and 1325, 2-0. We don’t totally know what to say about this event. 1360 and 2702 are the clear top robots in teleop, but neither has climb capacities and there are robots here who do. 4976 and 5024 are the best of these robots, but teams like 1075 and 5834 will be seeding and looking for teleop power if they hope to go past quarterfinals. 3739 has a very high ceiling too, so they’ll be looking to reach that at this event. For what it’s worth, we do not approve of the design decision to put a toilet plunger on a scissor lift but 6378 will still squeak onto our top 8 because of their cycling ability, under the condition that they control their adventures outside their frame perimeter on the opposite side of the field. 4525 is a special note. Even if they don’t fix their robot, their defense was the secret sauce to the 7th alliance at Durham 3-0’ing the 2nd seed, as long as they keep up with the meaning of G20. Ultimately, it will likely be 4976 + 1360 and 5024 + 2702 as your finalists, with 4976 and 1360 taking it in a rubber match. 3719 comes in as a hot topic, impressing New England locals with their defensive abilities at Rhode Island. It’s rather unlikely they find themselves on a top 4 alliance, but expect any alliance with them on it to be putting up a fight during eliminations – it’s up to whether or not the low seeded captains took note of their driving in week 4. Both 177 and 230 have had some hiccups this season, and will likely be duking it out for which team can pair up with 195. We’d like to predict that an upset could happen here, but 195 is 195 – the later the season goes, the harder it is to keep up with them. 195 may miss out on the #1 seed in quals, but they’ll be on the number 1 alliance regardless. If they do take first seed, they’ll pick 177. We think they’ll go 6-1 in elims, dropping a finals match. Pine Tree will feature one of the more exciting finals sets of the weekend, provided that it encompasses four of the top five here. 1519 and 5687 have already clean swept an event together in week 1, and we predict they’ll do it again here this weekend. 1729 put up a strong fight against 133 in week 3, and it is entirely possible that a 3 or 4 seed alliance consisting of 1729 and 1768 could fight their way into the finals. The wildcard here is - as per usual - 3467. They could be a top 4 robot, they could be a second round pick. We predict they’ll go in the first round to a 4th or 5th seed, but if they’ve practiced enough, could find themselves in finals. Stakes are high this weekend at Forest Hills, with 5 of the teams comfortably qualified for states and more than 15 looking to repeat or improve on early performance to make it in. The top performers this weekend start off with 2075, who swept Alpena #1 with a cool 73 district points and took home the autonomous award. If they can continue to average 8-9 game pieces a match, they’ll find themselves in the same position as last time, seeded 1st and picking their favorite partner. Also in the running for first seed are 910, 3357 and 2337, two of which have qualified and the third should have no problem getting enough points to make states. With the next best cycles per match at 7-8, 910 is the favorite to join them and take home a blue banner. Not to be left out are 226 and 4967, both bringing in consistent level 3 climbs and might turn up the heat and bring in an upset this weekend. In Lansing, it’s do or die, with nobody in for a 3rd play and lots of points on the table. 3707 headlines the event as the favorites, with the best cycling by a long shot, and hopes for a climber to take them over the top. Not far behind are 6067 and 3655, who carry effective climbers and match much of the field in their cycling skills. Hopeful for lucky weekends, 2611 and 4776 are both on the edge of qualifying for states, and with some small improvements they can get the points they need to make it there. In Traverse City, anything goes, and anything can happen. With only three teams over 40 district points, this event is the chance for many robots to make the push for states and hit that 70 point mark. 1684 are the favorite to win this event, with the fastest cycles and one of the best climbers here. 3767 is the next best cycler here, but without a way to hit level 2 HAB they may not be the right call for 1684’s partner. Competing for first seed this weekend is 6087, who brings in another consistent climber and with the right schedule can eek out 1684. Rounding out the top two alliances will be between 3688 and 3302, who cycle well and can make the difference between a filled cargo ship and adding lvl1 of the rocket ships to boot. 2122 has improved from their rough start to the season, so it’ll be them and 359 winning this event in dominant fashion. 4334 will put up a fight in finals but will have to rely on the wildcard to make it to Houston this year. Teams you might see with 4334 are 6485, who had a strong showing as the captain of the 3rd alliance at Canadian Pacific earlier this year, or 5015, who is yet to compete but have been practicing with 4334 at their shared build space all season. Other wild cards include 6351 seeded high at Canadian Pacific and will be looking to show that wasn’t just a lucky schedule, or 1622 performed well here last year after a slow start and wants to do the same in 2019. Likely, however, it’ll be 359-2122 teaming up to take the win over 4334-6485. This has been a breakout year for several Quebec teams, but it’s unlikely they’ll be able to hold off 4613 who’s coming in all the way from Australia on their way to the number 1 seed. Other top teams are 3986, 3386 and 3360 who all had strong showings at Montreal, as well as 3996 who captained the 4th alliance at Tech Valley. 5528 and 5439 have revealed their robot but are yet to land on Planet Primus, so they will need to quickly find their stride to be that first overall pick. 3889 is also someone who could mysteriously become relevant. They’ve never competed before but there’s FRC experience there that will show on the field. Likely, it’ll be 2478 leading the way - because you don’t get picked by 118 for nothing. They’ll have their choice when it comes to their partners, where the main decision to be made is before 4565 and 1492. 1492 has yet to compete this year but they are historically strong, and 4565 showed good cargo skills but their hatch mechanism will need some work to make them the obvious choice since they weren’t climbing at AZ North. The safe prediction is to say we’ll see 2478 partnered up with Team CAUTION to secure themselves the win. Don’t watch this event. It’s going to go exactly how you expect. Stakes are high at AVR. 1678 is coming in with 2 regional banners in 2019. 1538, 3476, and 5012 had weak initial regional showings but all have improved since. 5012 demonstrated their improvement last weekend in Idaho, where they pulled off an upset and won the event. 2073 and 6072 have strong robots, the addition of a climb, auto modes, and driver practice certainly will put these teams in Citrus’s radar. Will 1538 successfully complete their rebuild and get everything together to destroy in eliminations? Will 3476 become more stable and qualify for champs? Will 5012 repeat 2015 and end up winning another banner with 1678? Find out this weekend at the most exciting week 6 event in California! Pnw is pretty good, but I wouldn’t have put apex or skunks that high. They are definitely a strong mid pick, but I don’t predict a top 8 seed for them. We’re starting it off with PNW, since I guess PNW loves this account the most. Anyways, a lot can happen in two weeks. Love reading these each week. Thanks for the hard work! I would have to argue regarding the New York regional. People should watch it as the mighty powerhouse of 333 is going to be there. They are coming of their Einstein appearance last year. Now we can’t forget about 2869. They are also coming of their Einstein appearance. Therefore, in my opinion they can spice things up and upset 1796 and 694. I would also like to mention 2579 they had a lot of issues( sbpli1) but that machine is amazing. They can also cause an upset or end up locking the number one seed. Which means this should encourage people to watch the regional overall. Anything on Seven Rivers Regional @CYD? A lot of good teams competing there this weekend and you guys have been pretty good at doing the upper midwest. Anything on Seven Rivers Regional @CYD?
. Fingers crossed that God intervenes on this one. Can you call it love if i dislike it at best? 30 matches have happened already which has for sure biased by top 8, but whatever. honestly, DCMP is going to be a hell of a tossup. If alliance selection isint a bloodbath, then i will be dissapointed. is this ranking seed or something else? Numerical order based on team number. Joke’s on all of us. 7-0-0 and #1 seed in the clubhouse on Friday night, including a unicorn match. Holy crap. Their robot showed up during opening ceremonies today, 25 min before their 1st match.